can't comment on francis bacon. don't know him well enough. so perl's points are in an aesthetic vacuum for me. but they reduce to the usual perl points. we are all being gulled, our tastes subject to and ground down by all manner of marketing, including the museum blockbuster sort. & who am i to disagree? but perl can't but take this fairly obvious critique too far, and become insulting. (he's never happy unless he's at least a little insulting to those who do not share his unerring aesthetic aim). 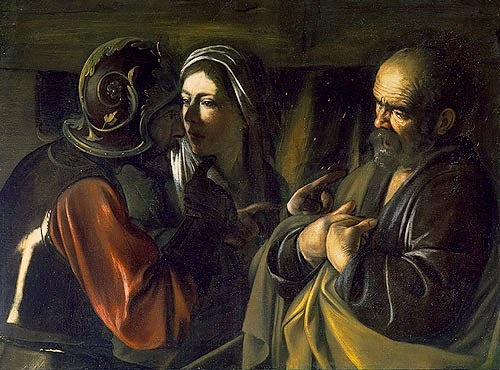 in this piece, perl writes: "in this wrongheaded tradition, caravaggio is admired not because he was a good painter but because he was a bad boy. . . "
is that so? it gives me the opportunity to say that's not why i admire caravaggio. in fact, i happen to think most of what i've seen of caravaggio is pretty, petty, and utterly forgettable. and then there are some canvases — i can't say how many, probably just a few — of incomparable power: visual, psychological and dramatic power. i remember sitting in the metropolitain museum for a long time in front of "the denial of st. peter". in brief, a woman — it matters that she is not demonic or a hag nor yet a beauty but of the flesh, a woman — is pointing out to a roman soldier that peter, to her right, had been part of the jesus cohort. peter is in anguish, torn and tortured, as he denies it, exactly as yeshu said he would. you can stare at this a long time and think about it. the only inhuman protagonist among the three pictured as i look at a reproduction is the roman soldier, armored and faceless. peter and the woman are in the light. what goes on between them? i think it's a brilliant painting, and psychologically complex. actually, i appreciate the dismissive violence of jed perl's opinions. i read him whenever i can — since his views encourage me to say what i like/"admire" in despite of his dismissal.